Ce B&B est très bien situé à quelques minutes des rues commerçantes restaurants et magasins. Très bon accueil. Chambre pour 3 bien équipée et confortable. Un très bon petit déjeuner complet et varié. Bref, une adresse à recommander. 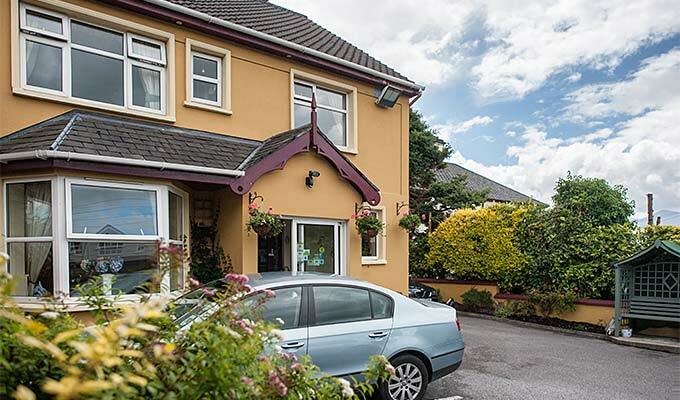 Great B&B with beautiful rooms very well located in Killarney. warm welcoming from hosts. Wir hatten einen sehr angenehmen Aufenthalt im Orchard House. Maria und ihr Mann sind sehr nette Gastgeber und hatten prima Tipps für uns. Frühstück und Zimmer perfekt und eine prima Dusche! Das Zimmer war ruhig gelegen mit Blick in den Garten. Alles fußläufig zum Zentrum. Vielen Dank!! A comfortable and very well-located B&B. Our gracious host was professional, accommodating, and extremely friendly. Such a pleasant home. Hosts were phenomenal and very warm and welcoming. House is close walk to downtown. Very comfy beds and if you get a chance to meet Buster and Joe 2 dogs, go for it! They are great. Such a great stay overall! Highly recommend, great place to stay, clean, charming, Marie and her husband are excellent hosts. Breakfast excellent, she is attentive to your needs, excellent recommendations for places to go and eat near by. Nice house, super location near main street, very sympathetic people. Location, cost and comfort made Orchard House a great choice for my stay. The genuine warm welcome and the best nights sleep in over a month of travel will mean this property will be my first preference for any future trips to Killarney. Our three nights stay at the Orchard House B&B was excellent. Maria has been a very kind and attentive host. The room was very clean and comfortable and each day started with a spectacular breakfast. Thank you very much, we had a great time. It was a very nice B&B, we will come again! Maria was a most welcoming and charming hostess. The rooms are excellent - well appointed and clean with sufficient space. The locations is ideal - 5 minutes walk into the city centre. This was the best out of the 4 B&Bs that we stayed in whilst in Ireland. Stayed here with my sister and parents for a few nights and Maria and Michael were very hospitable and welcoming. We thoroughly enjoyed our stay in the comfortable and clean rooms and welcomed in the morning with a lovely breakfast, well presented and plenty. Although a short stay, we left feeling that we had known Maria and Michael for years and thoroughly enjoyed their company and banter. Hope to return in the future. Recommend this B&B, very well located for the high street of Killarney. Thankyou Maria & Michael. This place was our home base for a couple days while exploring county Kerry. It is very homey and comfortable, with good food and very friendly and helpful hosts! It's very close to all kinds of shops and restaurants, but it's a couple minutes walk away, so the place itself is fairly quiet. My wife and I spent a week at the Orchard House. It was a delight to have Marie and Mike take care of our every need -- from picking us up at the bus station, providing a large comfortable room, serving an outstanding breakfast, and helping us plan our days in and around Killarney. The location was perfect for us -- we could easily walk into city center and the tour buses picked us up at our front door! We felt at home at the Orchard House which is just what we expect at a B&B! Great location, friendly, helpful hosts. Parking good. Good value for money with tasty breakfast and friendly owner. A really good location about 100 yards from the main street in Killarney. Although it is situated on a main road there is no problem with traffic noise. We stayed at Orchard house for one night. We enjoyed our stay. Everything was very clean, breakfast was good, and the location was great. Would recommend to anyone looking to stay in Killarney. Great location within walking distance of shopping, restaurants and bars. Maria was very hospitable and made reservations for dinner for us. Nice rooms and breakfast. Great stay, wonderful location. Quiet room, very short walk to town, St. Mary's cathedral and Killarney park. Breakfast was great. Would stay here again. Bring cash for payment. We had the pleasure of staying three nights in this wonderful B&B. The moment we arrived Maria was warm and welcoming! My husband and I stayed in the loft room and it was quiet and comfortable. There was even a little sitting area for us to enjoy. Our kids had their own twin room on the second level and it was very comfortable. The morning breakfast spread was SOO plentiful and there was so much variety. We could not even eat it all but we tried!!. The brown bread was great too! Maria let my kids meet her adorable pups and she made us feel like members of the family. By the time we left we had tears in our eyes and warm hugs goodbye. I also want to mention that the location is very convenient to downtown Killarney but not right on a busy street. Easy walk to town for dinners and quick drives to Killarney National Park, the Gap of Dunloe and more. We would not stay anywhere else if we returned to this area!!! We miss you Maria and thank you for welcoming us in. Maria Moloney is a helpful and adorable hostess. Very quiet room, close to the animation of the city center. Divine breakfast! Overall a great location and clean place! If you can, reserve the loft on the top floor! It is gorgeous. Had a great stay at orchard house.Maria was very informative locally and out with the town.Rooms,breakfast & service excellent.Will definatly be back & would highly recommend. Orchard House is an outstanding B&B, the ideal place where to stay if you visit the south west of Ireland. We were lucky to be Maria's guests, she and her husband were wonderful hosts making us feel comfortable in their house as soon as we arrived.And so we felt in a cosy nicely decorated room, so neat and clean with a shining bathroom! Breakfast is real delight with Maria attending to you and serving delicious food. We do recommend this address. Thank you Maria for a wonderful stay at your B&B in Killarney. The location is walking distance to the high street, which was very convenient. The room was very comfortable and clean. We would highly recommend your B&B and happily stay again! If you are considering a stay in Killarney you can do no better than the Orchard House B and B. Stroll the shopping streets, visit St. Mary's and search out great restaurants. Alternatively, it is just a very short drive to the countryside, the Ring of Kerry, Muckross House and Killarney National Park. You will be hosted by a charming, helpful, and thoughtful couple. We had an excellent two night stay at Orchard House. It is a short walk to the center of town, our hosts provided great service and suggestions. we would definitely recommend Orchard House. Location and great owners. This BnB is located very close to the high street ..so eating and shopping is very convenient. Maria and Mike were very friendly and went out of their way to help us. The facilities were great. We really liked this BnB and recommend it highly! This is a wonderful B&B that I highly recommend! The room was clean, lovely, reasonably priced with a great location and quiet at night. The beds were comfortable. You are close to the Ring of Kerry and the Dingle Peninsula. There is a laundry service at the end of the street that will do a load for 12 Euro and you pick up it folded and ready for use for the rest of your trip. We dropped it off in the morning and picked it up after our tour in the late afternoon. The town is just around the corner so that you can park at the B&B for free and walk. Wifi is free as well. I will say that this was the best breakfast I had on our trip. I will further say that I was served the best fried egg I’ve ever eaten in my life. How does she do it It’s just and egg, but it was spectacular! Maria and Mike were wonderful hosts and were so pleasant to talk with during our stay. It was a pleasure to stay at this B&B and I would highly recommend it to anyone looking to tour the area. Thanks for a very friendly welcome and cosy home. Lovely home and great hosts. Location is perfect and breakfasts are scrumptious! Just be mindful, they only accept cash. Since I had to confirm through the website with a credit card, I thought my card would automatically be used for payment but that is not the case. Le meilleur B&B de notre voyage!! Orchard house has a five star location, a mere 3 minute walk to the center of town. The rooms were comfortable and private. The beds were slightly stiff but not awful. Everything else made it a perfect stay. The breakfast was made to order and incredibly good. It was my first experience with a B&B and i was very surprised and very happy! Our stay at the Orchard House was the best B&B experience of our trip. The hosts were extremely nice, friendly and accommodating. They even made phone calls for us and turned our car around each morning for us. We were 5 traveling in a double & triple and as soon as one of the larger triple rooms was available they moved us rom the double without our asking for no extra charge. The breakfasts were so large and many choices, there's no need for lunch. The location is perfect just a 2 minute walk to High Street for many restaurants, pubs, stores and music. Free parking and quick access to Ring of Kerry from the north or south and Gap of Dunloe. Welcoming fire at night in comfortable living area with historical old photos of the town. 4 very clean and comfortable bedrooms upstairsdoubles & triples. Great prices and would definitely stay there again. Very good location, very kind people! Excellent breakfast! We loved staying there. Unfortunately our host was not able to welcome us due to some accident caused by the previous customer in what should have been our room, but she managed to arrange our transfer to another B&B nearby, with the same price and similar accomodation. A lovely, charming, comfortable, convenient B &B. The rooms are clean, nicely decorated and spacious. Maria and Michael are wonderful hosts who will pick you up at the train or bus station. Even though the B & B is easy walking distance to both of those, it's a luxury to get picked up when you are new in town and don't know your way around. Close to everything, good wi-fi, hot water, etc. Great breakfasts. Maria has been doing this for a long time and is a pro. She'll call and make your reservations for day trips no need to make reservations ahead of time-there's always room too. Definitely would love to stay here again if we are ever back in Killarney. On a recent trip to Ireland with my Father and Brother we stayed at the Orchard House. We had a wonderful stay, this property is only a three minute walk from the main street in Killarney. The rooms are cosy, beautyfully decorated with comfortable beds and the bathrooms ensuite. Our host, Maria, was very gracious. sociable and cooked us a wonderful breakfast. Best scones on the trip. If I have the opportunity to get back to Killarney, I hope to be able to stay here again. The stay at Orchard House was very pleasant. We were greeted very warmly, and we had a parking lot right in the courtyard, that was really great! The room and the bathroom were a little small for three girls with lots of luggage, but it was very nice and clean. And the breakfast was just perfect! It was Great! The rooms were all very clean and the breakfast was perfect! The guys were very friendly and the location is near the city. We had a wonderful stay at Orchard House B&B this past March! Feb 2015 : Excellent location to the ring of Kerry. Useful private parking since pretty tough to park in the city. Very close to city center, walking distance. Very friendly and welcoming hosts, they do their very best. No breakfast during winter season but reduced price accordingly. Tea or coffee possible in the bedroom. Very nice accomodation, warm, hot water, free Wifi, excellent bed. We enjoyed it very much ! My Mum says this is 10 out of 10! So who am i to argue.... It simply is a ten out of ten! Maria and Mike are fabulous hosts and we had such a fun time staying with them... It was really like staying with family - that you actually like :- . Nothing is too much trouble for Maria and the breakfast was absolutely delicious - especially the fresh fruit. Put this Bed and Breakfast on top of your list of places to stay. Our stay in the Orchard House was a very enjoyable experience and in our opinion a five star establishment. We were made very welcome and it was like a home from home. Maria was very helpful as to where to go for entertainment and sight-seeing. The room was comfortable and spotless. Lovely breakfast each morning, set us up nicely for the day. We would definitely stay there again. This was one of the nicest, most comfortable places we stayed in while in Ireland. We stayed in other B&B's, hotels and guest cottages and the Orchard House was extremely comfortable beds were heaven!, within walking distance to the village pubs and shopping, and very easy to park the car. Marie, our hostess, was extremely personable, friendly and helpful. The breakfast was delicious and more than ample for ourselves and our 20 something nephews. I would definitely recommend the Orchard House and will be coming back. Lovely B&B, great breakfast, wonderful owners. Super clean and attractively decorated. Great location, quiet and a short walk from the end of High Street. This is a great base from which to explore Killarney National Park. Mrs. Malloney can give you recommendations for restaurants and book local trips. Parking available, but if you come by bus or train, the owners will collect you from the station. Excellent accomodation. Maria and her husband are very friendly and helpful.The rooms are clean and comfortable. Breakfast is gorgeous and the location perfect: just a short walk to the city centre. Higly recommended address! Une superbe adresse ! Maria et son mari sont très chaleureux et leur maison est idéalement placée, près du centre ville mais tout à fait au calme. Excellent stay. Hosts were wonderful and extremely accommodating. Food was great too! House-keeper very friendly and helpful. One of the best breakfast we tasted in Ireland. Very clean and nice rooms. Very clean and nice, beautifully located close to the town center but far enough away to not be noisy at night. The owners were a lot of fun to talk to, and had great suggestions about what to see in and around Killarney. Absolutely excellent. The best of 5 B&B's i have experienced during my 2-week trip in July 2014. Excellent position, nice accomodation, rooms very clean, very good breakfast. Very well run. Congratulations ! Orchard House est une excellente adresse où nous avons été très bien accueillis par Maria et son mari Mike, toujours prêts à nous renseigner sur toutes les promenades et les activités à faire dans la région. Deux des atouts majeurs de ce B&B sont sa situation à 2 minutes à pied du centre-ville de Killarney et un breakfast divin. Merci encore pour ce magnifique accueil ! Nous sommes toujours très bien reçu chez Maria. Un sourire permanent pour un service impeccable. Trois ans que j'y reviens avec ou sans mes enfants. Maria a toujours le mot gentil et la prévenance d'une hôtesse d'exception. Elle vous prêteras son parapluie, s'il pleut, et sera de bons conseils pour vous recommander les meilleurs restaurants de Killarney. Quand on dit qu'elle est proche du centre, c'est à guère plus de 200 m, et pourtant elle est dans une rue calme. Les prestations sont parfaites, literie irréprochable et ambiance feutrée, De vrais petits appartements avec un petit jardin magnifique à l'arrière. Tout est pensé dans le moindre détail. Magnifiques décorations intérieures et extérieures. Parking pour quelques voitures devant et un "Breakfast" où rien ne manque, pas même les fruits du jardin. Nouveauté, cette année, il y a un salon/lounge pour regarder la télé... ou se détendre. Réservez ! mais laissez moi un peu de place pour y retourner, il y a 4 chambres ! Bisous à Maria, et à sa famille, au passage. A l'année prochaine Joël, Amandine and his boy friend. Wonderful B&B! Our room was better appointed than some of the castles we stayed at during our visit! Great to have a full shower curtain in our bathroom and even had a bidet! Incredibly convenient location...steps away from great dining and shopping. Will definitely stay at Orchard House on our next trip...truly excellent Irish hospitality!!! Excellent! We enjoyed our stay so much. Very friendly, a great Irish Breakfast, the room was very big and we felt like at home. If we are going to Killarney next time, we will book this b&b again. Excellent place! The best B&B we had in Irland. We cam as a family with 3 children. The owner paid attention to any little detail. The atmosphere was great. We were accepted very warmly, enjoyed a great Irish breakfast. We enjoyed the big and beautiful rooms, with great view to the charming garden and comfortable bed and bath rooms. Hope to enjoy this place again. Mostly recommended. having found this wonderful b&b by accident it was absolutely ideal for my needs.marie & mike were the perfect hosts very helpful in every way and helped me in my hour of need,would recommend this b&bto anyone wishing to find accommodation in Killarney thankyou to both of you bob. Lovely little B & B with a wonderful Irish breakfast included! We hope to have the opportunity to visit again sometime! Maria is the perfect hostess. She is warm, full of pieces of advice and funny. We spent a great night at her place. We highly recommend the Orchard House for it is convenient to find, close to city center and very clean/cosy. Very gentle and nice host, we enjoyed it very much! EXCELLENT ! We had a great time at Killarney. The B&B is located at 5 minutes from the center of the city. The bedroom is very confortable and cosy. The owners are full of attention for their guests and give you advice to get the best time in their area. We really recommend it.